Outdoor fireplaces, pizza ovens & firepits: Phoenix, Scottsdale & NW Valley. Add the element of fire to your Arizona landscaping. You can choose the traditional rounded Southwest beehive’s style, something with unique artsy flair, or a shape that is more modern and rectilinear. All outdoor fireplaces we build will follow precise construction guidelines and include a standard fire code firebox. All the finishes popular with today’s Arizona homeowner are available: stucco, stone facing or tile . Each of the Scottsdale and Phoenix outdoor fireplaces we design is totally unique. You’ll find it easy to create outdoor living space elements that beautifully compliments your home, courtyard or patio design and individual taste. You can count on top quality craftsmanship built into every inch of the project. The finished structure will bring you beauty and function for many decades, be it gas or woodburning. Visit our Outdoor Fireplaces Portfolio & Fire Pits Portfolio. Add a pizza oven or bread oven. Your patio fireplace can double as an old world wood-fired pizza oven. Naturally, when you have such a cool feature on the patio, investigating baking fresh bread or cooking entire meals is the next step for anyone who has an outdoor pizza oven. When you’ve got limited space, this is the perfect way to enjoy artisan cuisine, and the ambiance of a hearth all in one compact unit. You won’t find pizza ovens like ours anywhere else in the Valley. Last time we checked, such a thing only existed on the other side of the Pacific. Prefer a gas-burning pizza oven-fireplace combo? No problem! Wood or gas fire pits to fit your outdoor space. While the most common shape for backyard fire pits is round, you can also choose to have yours be any shape at all. From a square or rectangle, to oblongs or L-shapes. That’s the great thing about custom designed and built additions to patios and pool decks, each element can perfectly fit the space and your lifestyle. You can count on fine quality in materials and construction with Scottsdale or Phoenix outdoor fire pits from Desert Crest. Each one is unique to the customer’s requirements and taste. 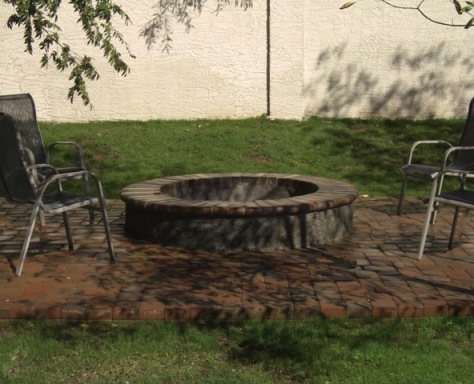 Our skills allow you to choose a fire pit crafted from stone, paver blocks or adobe finished concrete. Whether you wish your fire feature to be wood burning or gas, one call gets the whole project done. No other contractor will have to be involved, we are licensed and insured to handle everything.